Acute hepatitis E virus infection after liver transplant is a challenging clinical phenomenon. Due to its unspecific clinical and histological presentation, the diagnosis of acute or chronic hepatitis E virus infection can be difficult in unclear cases of elevated liver enzymes. Here, we report the case of a 56-year-old male patient who presented to our center for 17-year follow-up after liver transplant with α1-antitrypsin deficiency. The patient was asymptomatic but had remarkably increased transaminases and cholestasis parameters. Blood levels for immunosuppressives were in the normal range, and cholestasis and deteriorated liver perfusion were excluded by ultrasonographic examination. A liver biopsy was performed that was histologically interpreted as acute cellular rejection grade I. Accordingly, the patient was treated with 5-day high-dose intravenous steroids and increased doses of the maintenance immuno­suppressive agents, resulting in the slow normalization of the liver enzymes. Extended laboratory examinations revealed presence of acute hepatitis E virus infection, and a retrospectively immunohistologic staining of the liver biopsy was positive for hepatitis E virus antigen. Acute hepatitis E virus infection can be a reason for acute allograft dysfunction after liver transplant. This differential diagnosis should be kept in mind, especially when graft dysfunction occurs long after transplant. In this report, we describe a case of unclear biochemical graft dysfunction 17 years after liver transplant that was initially diagnosed and treated as acute cellular rejection; consecutively performed laboratory and immunohistochemical analyses later revealed acute HEV infection of the liver allograft. We report a case of a 56-year-old male patient who received a liver transplant in August 1997 for treatment of α1-antitrypsin deficiency. The patient had a completely uneventful course and showed an excellent adherence since transplant. He was immunosuppressed with low doses of tacrolimus (1.5 mg/d) and mycophenolate mofetil (500 mg/d), which resulted in stable immunosuppression trough blood levels over the past 17 years (Figure 1). At his 17-year posttransplant follow-up, the patient appeared totally asymptomatic. However, laboratory findings showed remarkably increased levels of transaminases and cholestasis parameters (Figure 1), although the tacrolimus trough level was 5.8 ng/mL. Bile outflow obstruction and decreased blood perfusion were excluded after ultrasonographic examination. The patient was hospitalized, and a liver biopsy was performed. The urgent pathology evaluation showed portal inflammation overlapping to the bile ducts and vessels, which was interpreted as type I acute cellular rejection according to the Banff classification (Figure 2A). A methylprednisolone pulse therapy (500 mg intravenously for 5 d) was initiated. Furthermore, the patient’s tacrolimus (from 1.5 mg/d to 6 mg/d; Astellas Pharma GmbH, Munich, Germany) and mycophenolate mofetil (from 500 mg/d to 1000 mg/d; Hoffmann-La Roche AG, Basel, Switzerland) doses were increased. Other causes of increased liver enzymes such as cytomegalovirus, Epstein-Barr virus, or hepatitis A, B, or C infections were excluded. However, signs of acute HEV infection were found (positive anti-HEV immunoglobulins M and G and weakly positive HEV-RNA). With respect to the low viral load, genotyping was impossible; however, indigenous HEV infections in Germany are usually caused by genotype 3 HEV. With further questioning, the patient denied both travel activities in known endemic regions and consumption of raw pork meat. Therefore, the HEV infection was interpreted as marginal phenomenon due to the clear histologic finding of acute cellular rejection. 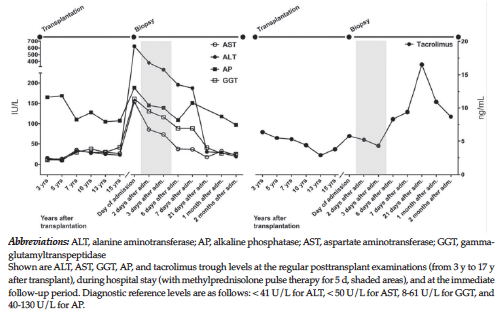 The transaminase levels and cholestasis parameters slowly declined under methylprednisolone treatment, and the patient was discharged 7 days after hospitalization with almost normal blood values (Figure 1) and in good medical conditions. Follow-up showed complete remission of HEV infection and normal liver enzymes. 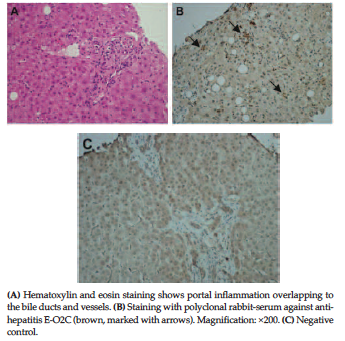 To investigate whether HEV infection or acute cellular rejection was the leading reason for liver dysfunction, immunohistologic staining for HEV was initiated (polyclonal rabbit-serum against anti-HEV-O2C; kindly provided by F Struck, Mikrogen, Martinsried, Germany). Immunohistology revealed specific extranuclear HEV antibody binding (Figure 2B). In synopsis of these findings, acute HEV infection rather than acute cellular rejection was considered as the most probable reason for the episode of biochemical graft dysfunction. Acute or even chronic HEV infection should be considered as differential diagnosis in cases of unclear and asymptomatic liver enzyme elevation. This is particularly important because acute HEV can present with different histologic pictures.11 Making the correct diagnosis is essential for choosing the adequate treatment for immunocompromised patients with HEV infection. An untreated HEV infection may establish a chronic infection and cause graft cirrhosis. In our case, the laboratory parameters quickly normalized under treatment with increased tacrolimus doses and methylprednisolone addition. However, in retrospect, we assumed that this was the natural course of the self-limiting infection. Ribavirin treatment would have been the best option in cases of persistent viremia; however, with respect to the time gap to diagnosis, the low viremia, and the spontaneous decrease of the transaminases, no further treatment was necessary. Furthermore, at the time when HEV was detected, we were not totally certain whether the biochemical graft dysfunction was due to acute cellular rejection with a coexisting HEV infection or due to acute HEV infection that looked like rejection. Therefore, an HEV polymerase chain reaction and/or HEV antibody screening (dependent on the grade of immunosuppression) should generally be performed in patients with suspected HEV infection. We hypothesize that the histologic picture of portal infiltration, which was seen in our case and interpreted as acute cellular rejection, was caused by lymphocytes infiltrating the infected liver, thereby mimicking the picture of acute cellular rejection.11 Whether HEV infection can trigger acute cellular rejection remains unclear. Because we found acute HEV infections in 3 consecutive tests showing unclear liver enzyme elevations at our transplant center, with 1 of these also histologically diagnosed as acute cellular rejection, acute HEV may occur more frequently in liver transplant recipients than previously suspected. Acute HEV could therefore be an underestimated reason for acute allograft dysfunction after liver transplant. Behrendt P, Steinmann E, Manns MP, Wedemeyer H. The impact of hepatitis E in the liver transplant setting. J Hepatol. 2014;61(6):1418-1429. Kamar N, Selves J, Mansuy JM, et al. Hepatitis E virus and chronic hepatitis in organ-transplant recipients. N Engl J Med. 2008;358(8):811-817. Liu X, Shen T, Wang Z, et al. Hepatitis E virus infection results in acute graft failure after liver transplantation: a case report. J Infect Dev Ctries. 2014;8(2):245-248. Maddukuri VC, Russo MW, Ahrens WA, et al. Chronic hepatitis E with neurologic manifestations and rapid progression of liver fibrosis in a liver transplant recipient. Dig Dis Sci. 2013;58(8):2413-2416. Haagsma EB, Niesters HG, van den Berg AP, et al. Prevalence of hepatitis E virus infection in liver transplant recipients. Liver Transpl. 2009;15(10):1225-1228. Buffaz C, Scholtes C, Dron AG, et al. Hepatitis E in liver transplant recipients in the Rhône-Alpes region in France. Eur J Clin Microbiol Infect Dis. 2014;33(6):1037-1043. Klein F, Neuhaus R, Hofmann J, Rudolph B, Neuhaus P, Bahra M. Successful treatment of chronic hepatitis E after an orthotopic liver transplant with ribavirin monotherapy. Exp Clin Transplant. 2015;13(3):283-286. Schlosser B, Stein A, Neuhaus R, et al. Liver transplant from a donor with occult HEV infection induced chronic hepatitis and cirrhosis in the recipient. J Hepatol. 2012;56(2):500-502. Kamar N, Abravanel F, Selves J, et al. Influence of immunosuppressive therapy on the natural history of genotype 3 hepatitis-E virus infection after organ transplantation. Transplantation. 2010;89(3):353-360. Kamar N, Izopet J, Tripon S, et al. Ribavirin for chronic hepatitis E virus infection in transplant recipients. N Engl J Med. 2014;370(12):1111-1120. Protzer U, Böhm F, Longerich T, et al. Molecular detection of hepatitis E virus (HEV) in liver biopsies after liver transplantation. Mod Pathol. 2015;28(4):523-532. Wendum D, Nachury M, Yver M, et al. Acute hepatitis E: a cause of lymphocytic destructive cholangitis. Hum Pathol. 2005;36(4):436-438. Hübscher SG. What is the long-term outcome of the liver allograft? J Hepatol. 2011;55(3):702-717. Florman S, Schiano T, Kim L, et al. The incidence and significance of late acute cellular rejection (>1000 days) after liver transplantation. Clin Transplant. 2004;18(2):152-155. Nakanishi C, Kawagishi N, Sekiguchi S, et al. Steroid-resistant late acute rejection after a living donor liver transplantation: case report and review of the literature. Tohoku J Exp Med. 2007;211(2):195-200. Acknowledgements: The authors declare that they have no sources of funding for this study, and they have no conflicts of interest to declare. KH, RA, JH, DE, MS, and NR were involved in the concept, data analysis/interpretation, critical revision, and drafting of the article, SG, BS, MK, PT, IS, and JP were involved in data analysis/interpretation, critical revision, and article approval. M Stockmann and N Raschzok contributed equally.